House of Anansi Press, 9781770898684, 256pp. At David Usher's company, CloudID Creativity Labs, a sign on the wall reads: Dream big, let the elephants run The words are a reminder for us to hold a place in our minds for big ideas. 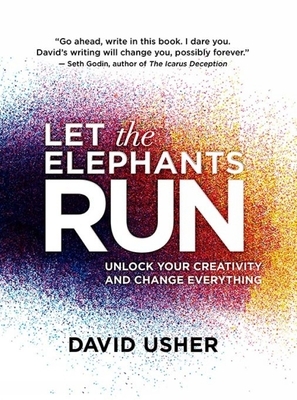 Based on his wildly popular speaking engagements, Let the Elephants Run shows us how to reignite creativity whether in the head office, the home office or the artist's studio. Usher believes creativity is in our DNA; it's in everyone, not just the creative class. We all start our lives as creative beings but for many, that spark of creativity becomes lost over time. Usher empowers readers to achieve more ah ha moments through two cornerstone principles of creativity: freedom and structure. Using photographs, artwork and illustrations, he shows us that creativity is not magic; it is a learnable skill that any person or business can master. The dynamic full-colour design includes action pages to help readers start cultivating the habit of documenting their ideas for future execution. David Usher is a musician, entrepreneur and keynote speaker. He has sold more than 1.4 million albums and toured all over the world. When David is not making music, he is equally passionate about using technology to build new and interesting businesses. His company, Cloudid Creativity Labs works on vast range of innovative projects, from building web platforms to creative consulting for companies like Cirque du Soleil and Deloitte. David sits on the advisory board of McGill University s Institute for the Public Life of Art and Ideas and is the founding director of Amnesty International s Artists for Amnesty."